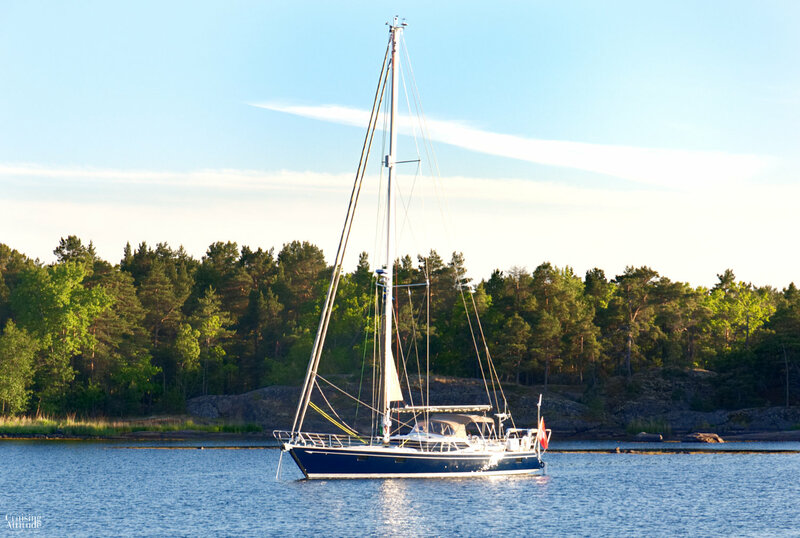 We left Kalmar marina with a great sense of anticipation — within the next 20 or so nautical miles, we would entering archipelago country! 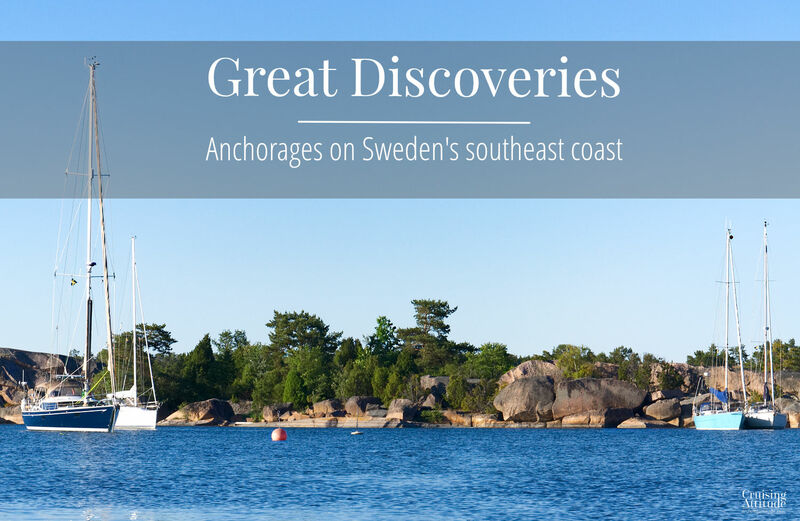 Archipelagos and the natural anchorages among the thousands of islands are the true reason for sailing in Sweden. 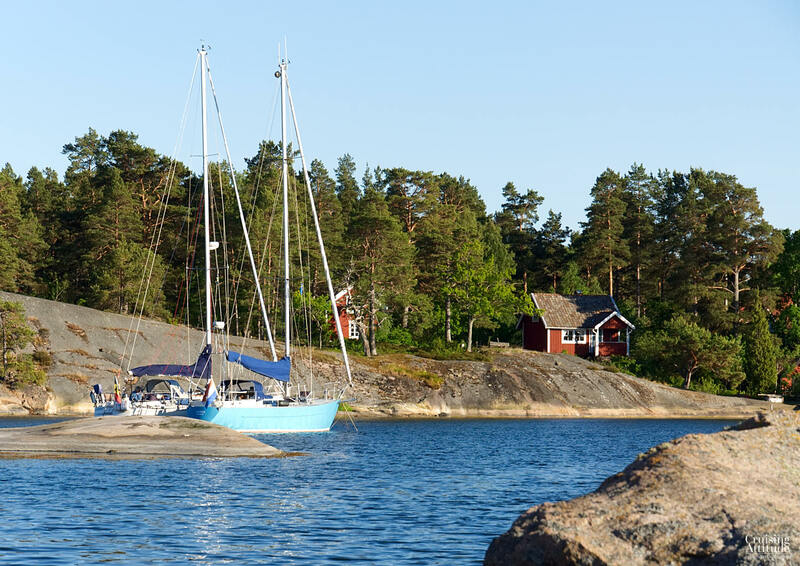 We’d like to share our favourite natural anchorages in the various Swedish archipelagos , and here is one of our absolute favourites — Kiddeholmen. 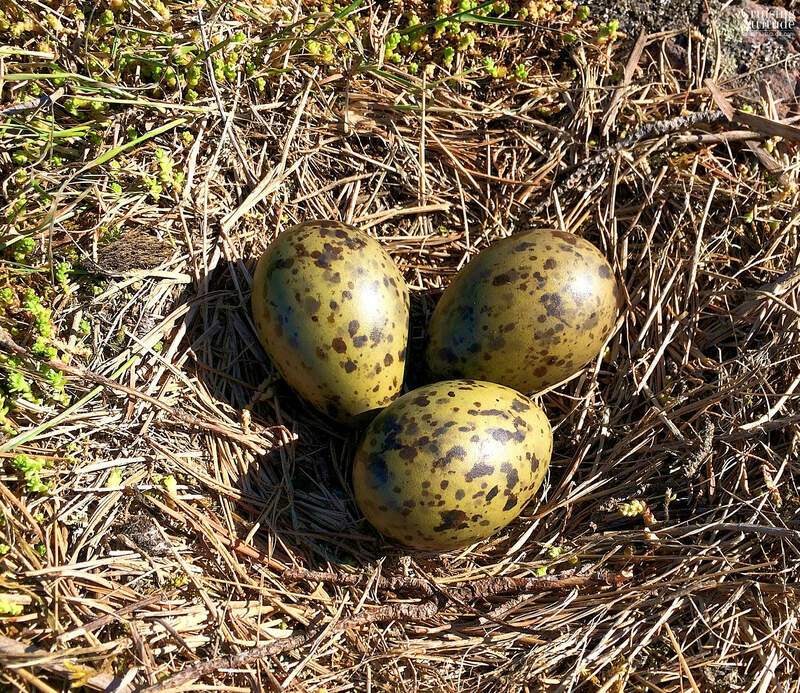 It’s located in the archipelago of the north Kalmar Strait (sea between the Swedish mainland and the island of Öland), just south of the town of Oscarshamn. 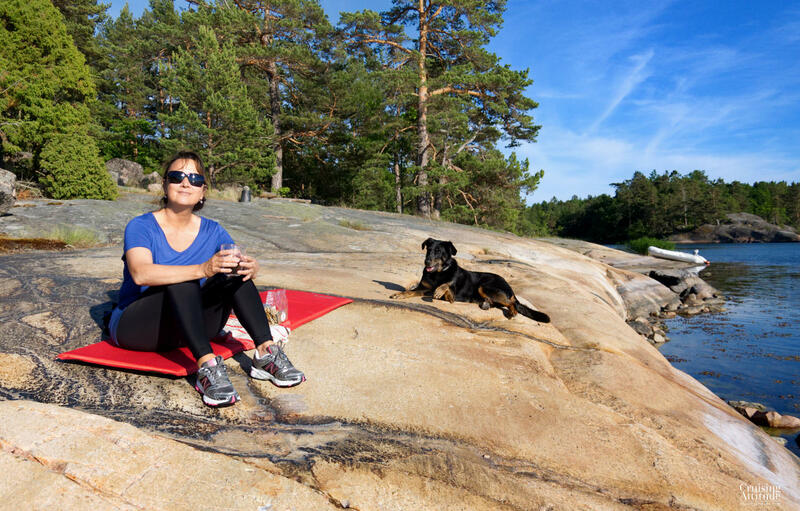 You have a great view of the famous (in Sweden) Blå Jungfrun. From a distance, it looks like a volcanic island. Behind Blå Jungfrun, you see the island of Öland in the distance. The cosy anchorage of Kiddeholmen. 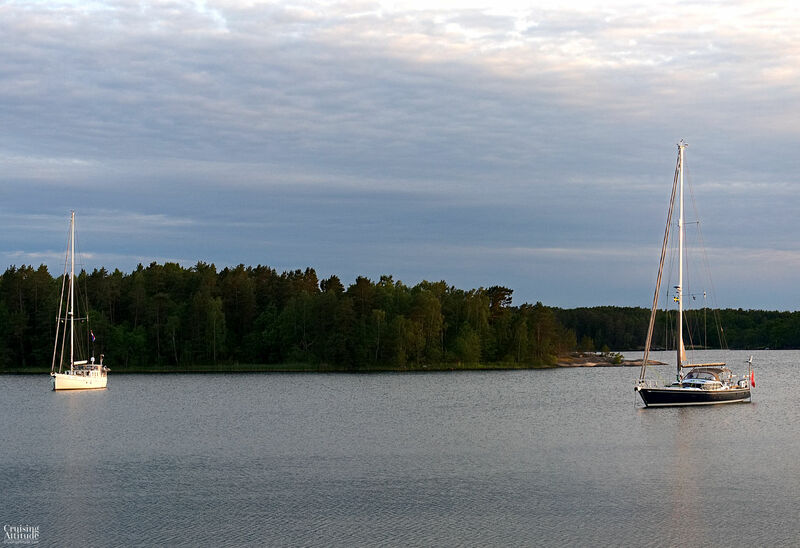 There are a couple of mooring buoys but these are reserved for Swedish Cruising Club registered boats and have a weight limit of only 9 metric tons. This anchorage is suitable for all winds, but might be a bit uncomfortable in this spot during easterly wind (looking east towards the open Baltic). This photo was taken at around 10 in the evening. The light gives everything a golden tint. The approach is a bit nerve-wracking as it’s quite narrow just at the entrance. The depth, according to our depth finder, was 2.5 meters, but this always depends on the current sea level. 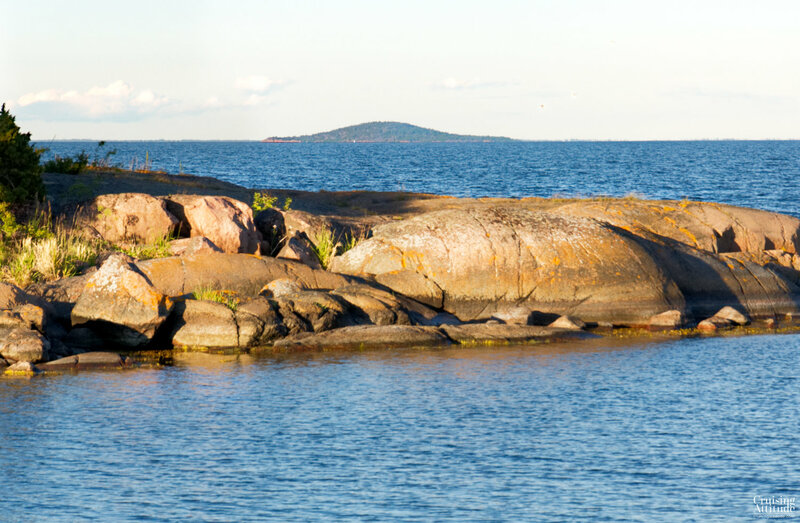 There are no real tides in the Baltic, but barometric pressure and weather systems can have a great effect on sea levels. You can easily have one meter of difference from one day to the next if the barometric pressure changes greatly. 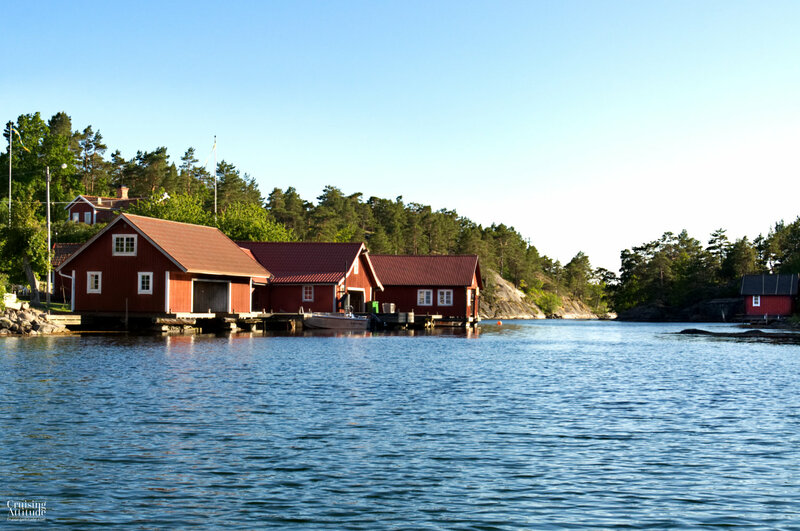 Check this site every day for sea levels if you’re sailing around Sweden. Once you’re past the entrance, Kiddeholmen gives you lots of good spots for putting down the anchor. 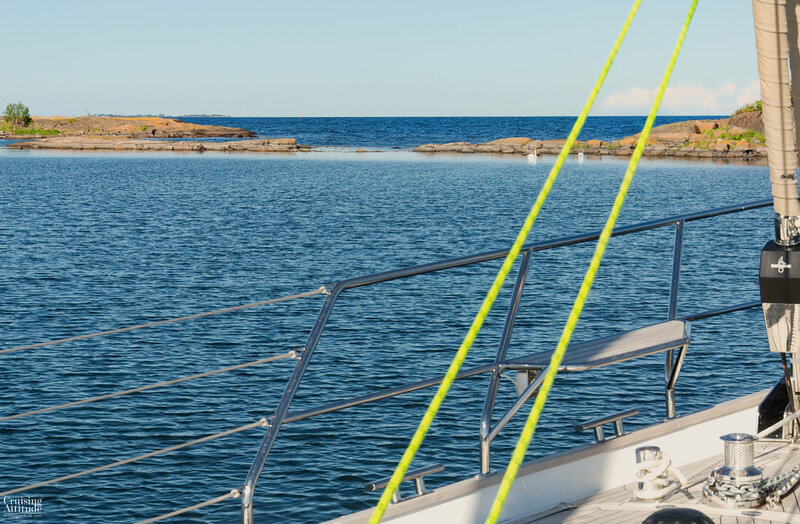 The Swedish Cruising Club (SXK) has installed two of their blue mooring buoys for its registered boats, but they are safety-rated for only 9 tons or less. Don’t use them unless your boat is registered with the SXK — at least not during the high season between mid-June and mid-August. If you have a decent anchor, the holding is very good (thick mud mixed with clay). Our 55 kg Spade dug in pretty quickly. We stayed on the inner archipelago route on our way north. Although it’s much slower to weave through the thousands of islands on the east coast, it’s so much more interesting, not to mention beautiful, to use the inner fairways. The ever-changing landscape with its forests, small farms, fishing villages and summer cottages makes the voyage more entertaining. The sailing is more challenging as well. 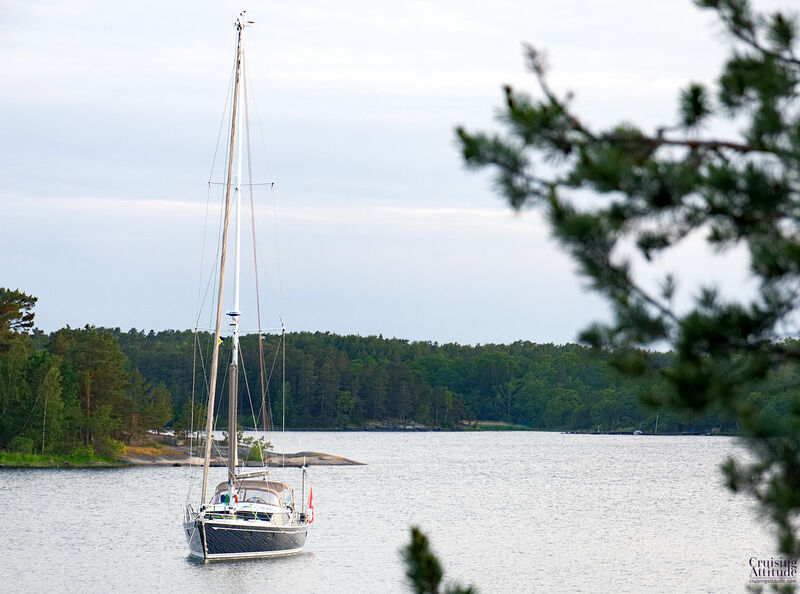 No “auto-piloting” here — it’s hand-steering once you get into the archipelago. Charting a course every morning would be ridiculous. You’d have to plot a hundred different course changes every day. No — you just have to use your charts and your eyes. 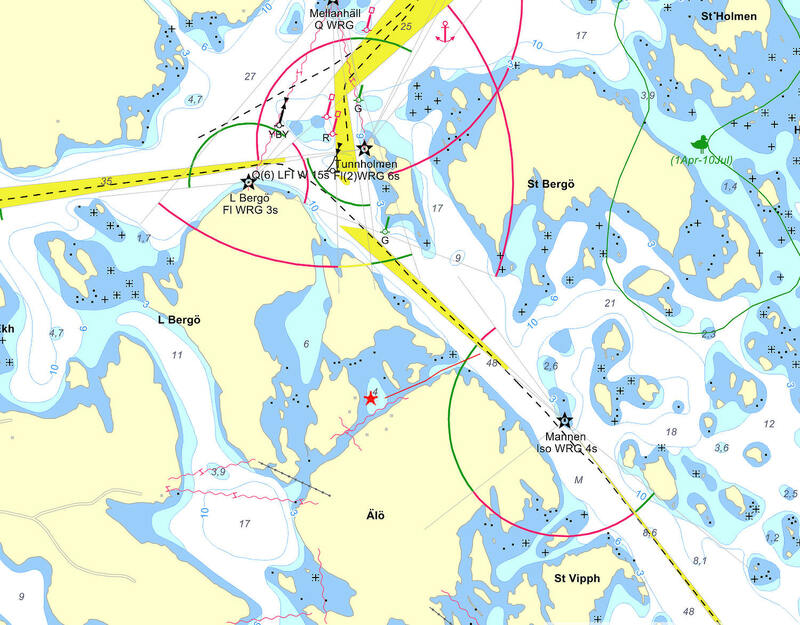 This is the way I learned to navigate back in the 80’s and sailed in the Stockholm archipelago. GPS had not yet been invented. On our way up to the anchorage of Älö. 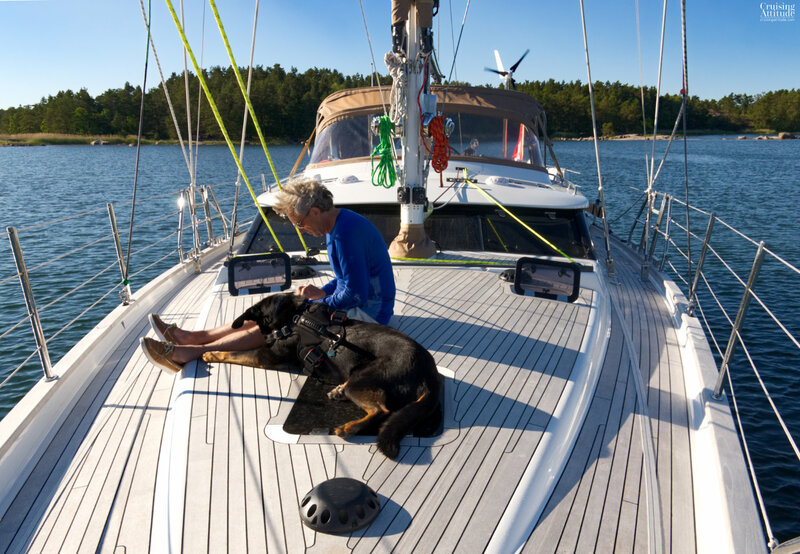 We chose an anchorage that wasn’t far away — just 20 nm or so — so that we’d have more time to relax, take Senna for a walk on one of the islands or have a swim, and then prepare a good dinner. 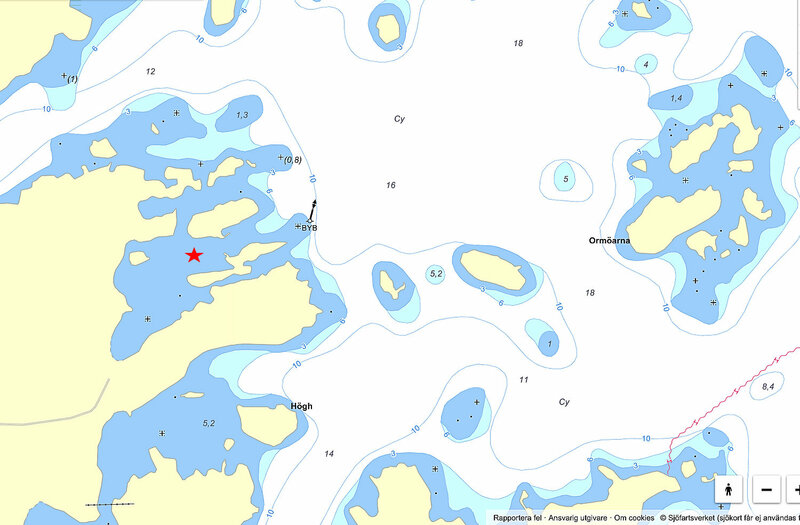 Our first choice was Stora Vippholmen, which you see on the chart below, just south of Älö. That tiny anchorage was full, however, when we arrived. Small but utterly charming anchorage of Älö — here you see the typical Swedish red and white houses and cottages. 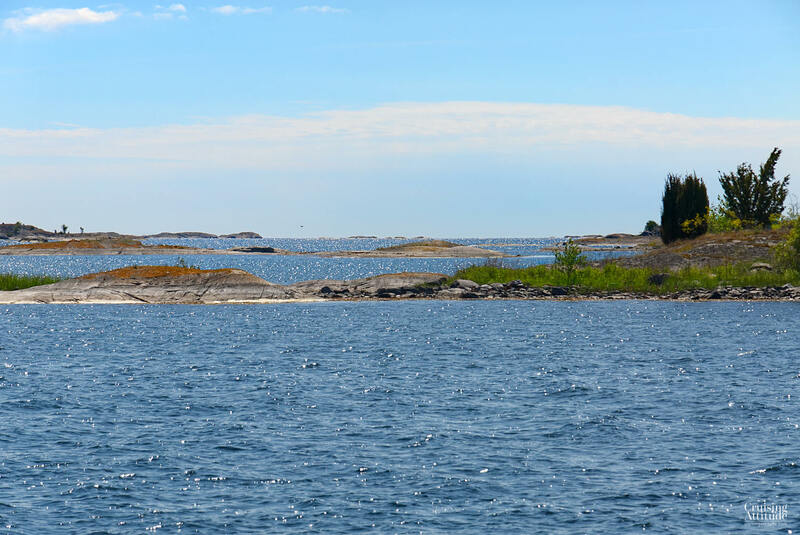 We continued on to the anchorage on the north side of Älö and we were so happy we did. It is so peaceful and idyllic – it looks as if time stopped in the 1950’s! The islands here were used purely by fisherman and their families – now, about half of the houses are summer holiday/weekend cottages. Relaxing with Senna. The flush hatches and Air-Only dorades make so much more space available on the foredeck. 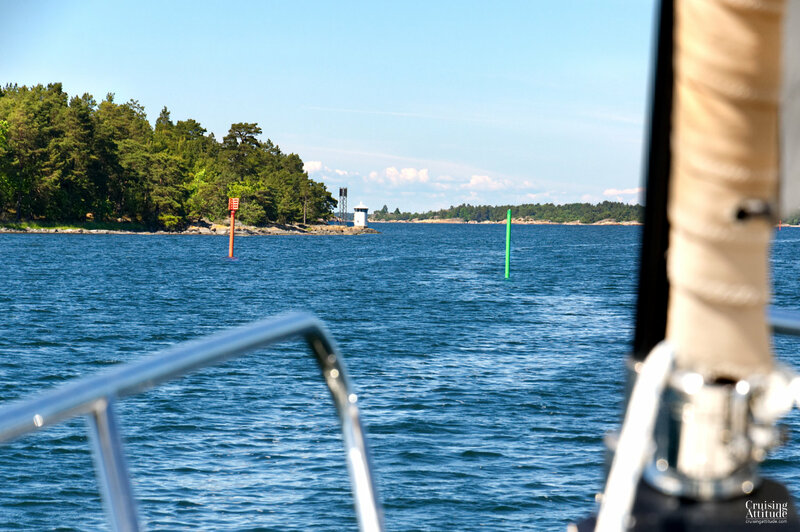 The entrance to the anchorage is just off the marked fairway, north of the lighthouse “Mannen” and south of the lighthouse “Tunnholmen”. It’s quite narrow, but large enough for our boat that measures almost 5 meters across. Just a warning, don’t try this anchorage if you need more than 2.5 meters of depth. Again, check the sea level forecasts to determine if you can go in or get out again. If you have just enough depth to pass through today with 1015 Mb, what will you do if there’s 1029 Mb forecast for the next 2 days? Keep in mind that the depths written on the charts are average depths, not the lowest astronomical tide (LAT) depths. 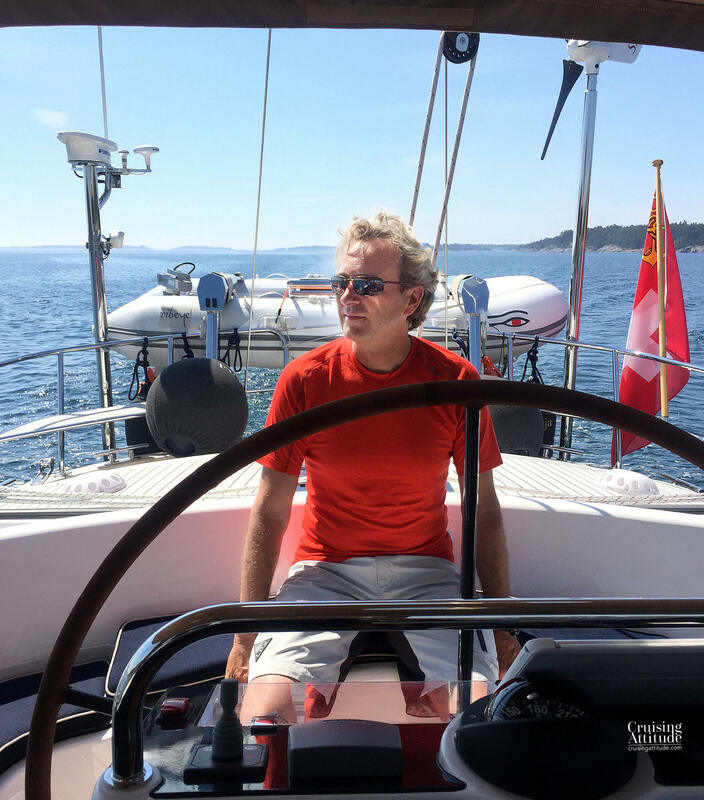 The holding in this anchorage is excellent — our Spade dug in almost immediately and didn’t go anywhere when we backed down at 2500 rpm, despite the short scope (25 meters out for 4 meters of depth). It’s a small anchorage that already hade 3 boats in it, and we were afraid a few more boats would join us. One other large sailboat did come in after us and it anchored just behind. 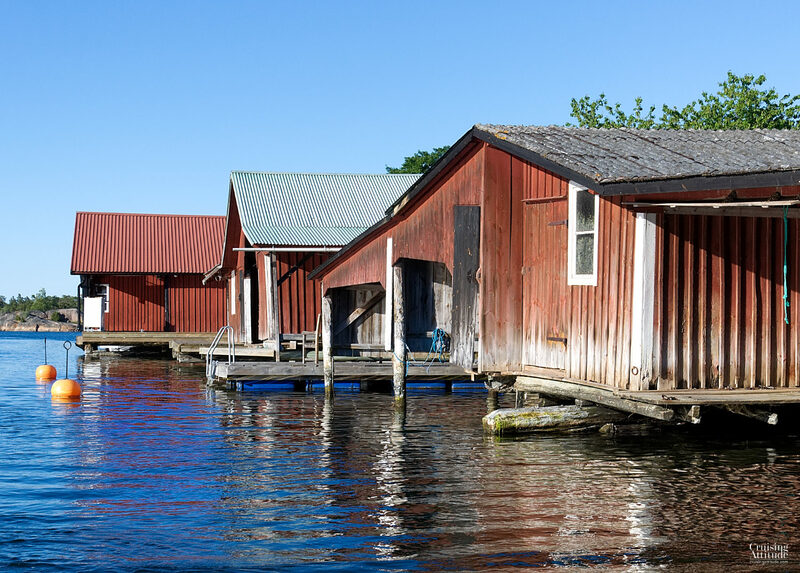 If you have a dingy, it’s worth getting into it and exploring both the nature and the boat houses dotting the periphery of Älö island. The winds for the next 2 days were forecast at 20-25knots from the east. With that kind of forecast, you generally avoid the outer islands which tend to be quite low. 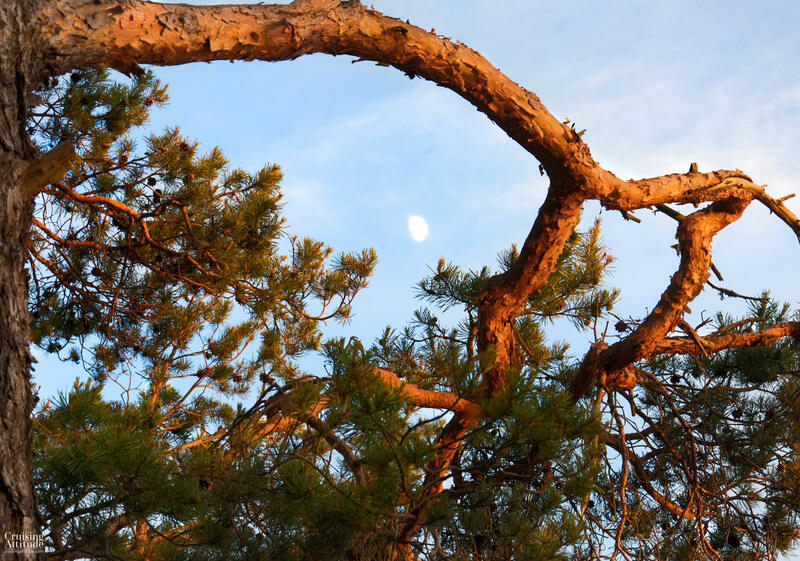 They also have less vegetation, especially of the tall tree variety. No tall trees = no wind protection. The photo below gives you an idea of how the outer islands look. Sailing northbound to Smågö, our next anchorage. Such beautiful weather! 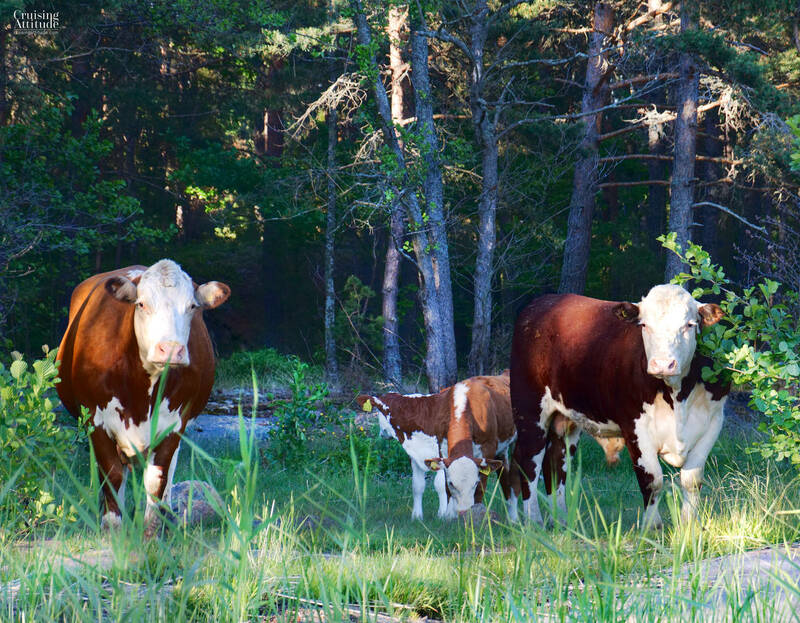 Smågö is about 45 minutes from the north/south marked fairway, but it’s well worth the voyage. 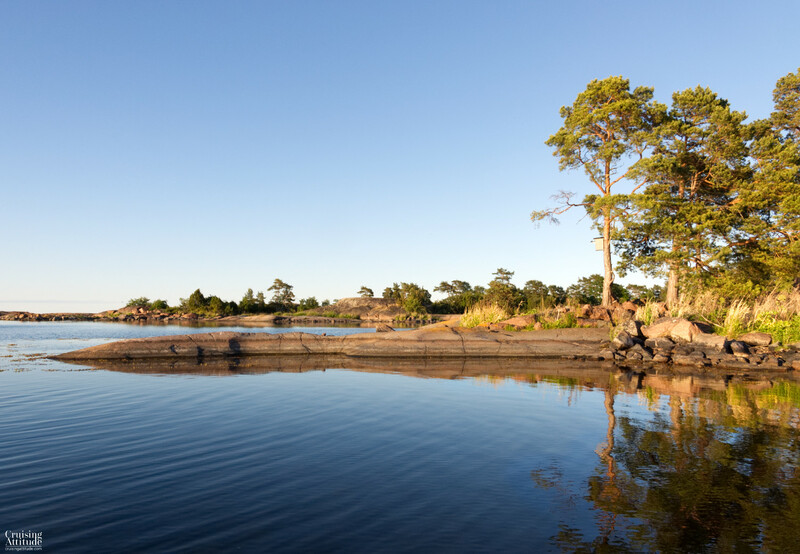 You turn northwest to follow the fairway that ends in Loftahammar (at 57°49″N, 16°49E), then turn west when you see the marked fairway that begins north of Rågö (1 red and 1 green mark). Happy hour on one of the islands. The weather was so warm and the water so clear that I just had to go for a swim. The water was cold though, so we didn’t stay in for very long! We liked this anchorage so much that we stayed for three nights! That gave us a change to do some cleaning and preventative maintenance on the boat and still have enough time to relax with a book and a glass of wine at the end of the day! The anchorage is huge and you can find shelter from any wind here. 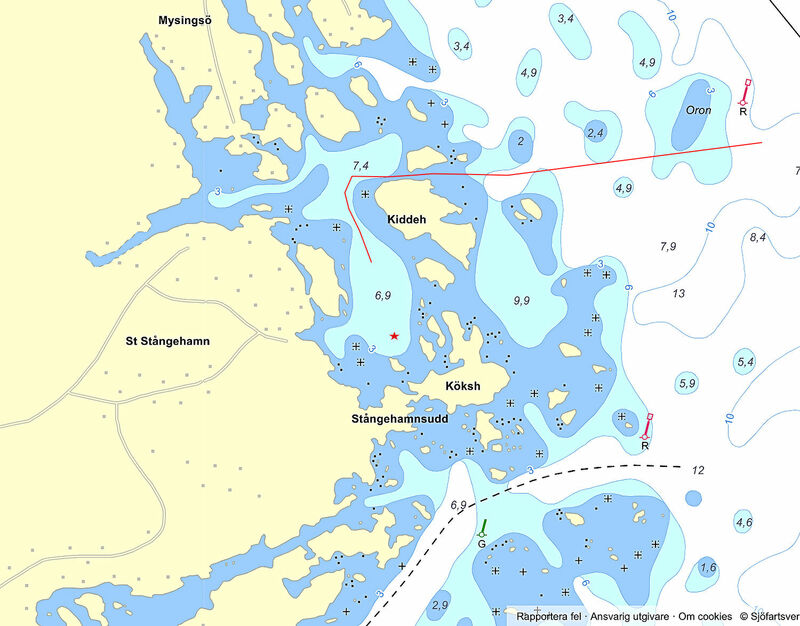 You can also go in between Smågö and Solidö. The holding is good once you’re dug in, but you’ll need to find a spot that is sea-weed free. We needed three tries to get the Spade in. The type of seaweed that has air bladders (Bladder Wrack) grows in abundance here, and in the spring and early summer, it’s hard/impossible to see from the surface of the water at 5-6 meters of depth. 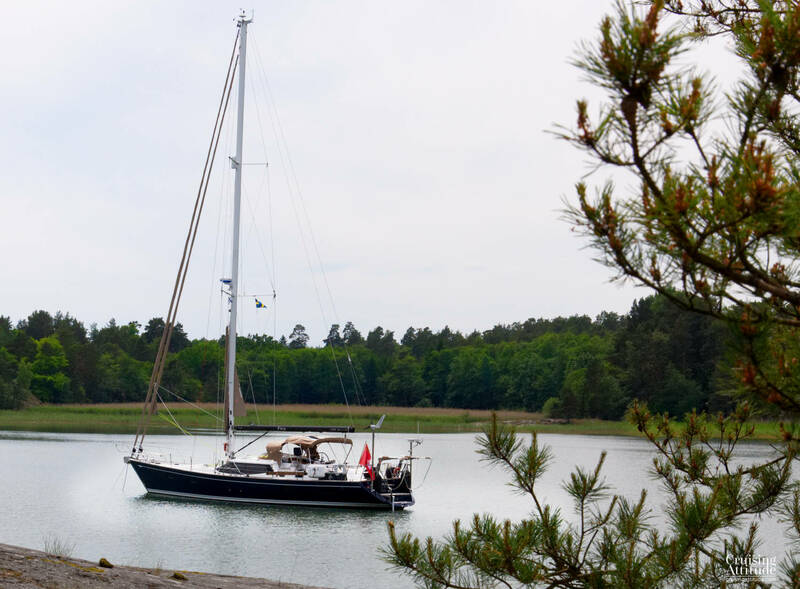 If you like to moor up the “Swedish way” (a 3-point mooring with two lines to 2 different trees on the island and a stern anchor), there are a few places that will accommodate you but not as many as you’d think. The shoreline is so rocky that we had a problem finding a place to approach with the dinghy. 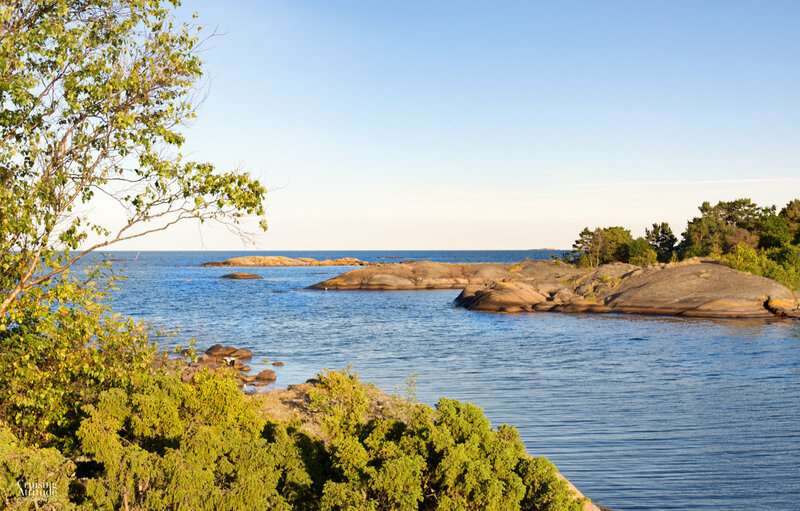 A large garbage bin for cruisers has been placed on the island of Smågö. Something to keep in mind if it’s been awhile since your last marina visit. About 45 minutes from the marked fairway that goes north/south, but worth the trip. When we arrived at Risö, the weather was still half-sunny. But that was about to change. The next morning, the skies were grey. We would have rain for the next 24 hours. A small low-pressure system delivered light rain during the night. The skies were telling us that it wasn’t over yet and the local forecast called for heavy rain for the next 24 hours. We would have rain for the Bråviken crossing and up to Oxelesund, where we had reserved a place at the marina. We needed to go grocery shopping! Entry to the anchorage is easy, just don’t try to slip in between the east cardinal and the tip of the island. The shore is shallow and rocky. 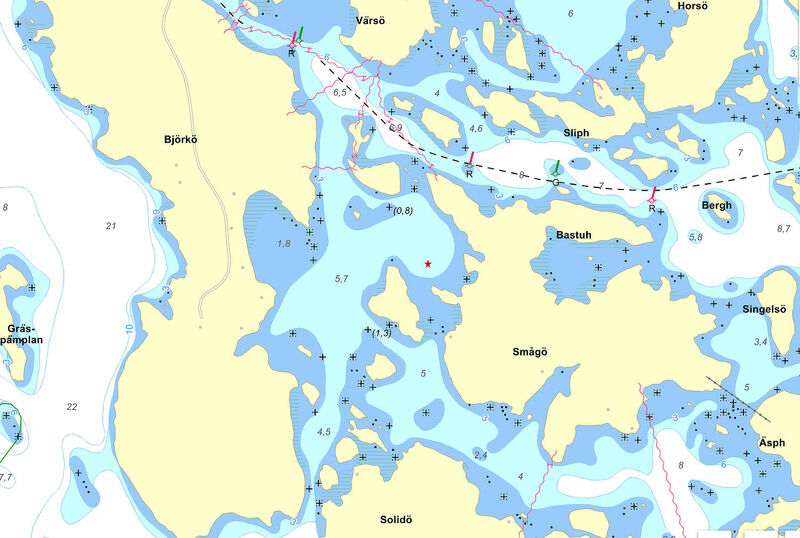 There is room for “Swedish mooring” for 3-4 boats depending on their size, on the island south of the red star that marks our anchor (see the boat in the first photo ). The anchor holding is concrete-strong (dense clay). Unfortunately, it’s so much like concrete that it’s really difficult to wash off. Be warned — it took us 15-20 minutes to spray the hard and sticky clay off the anchor! 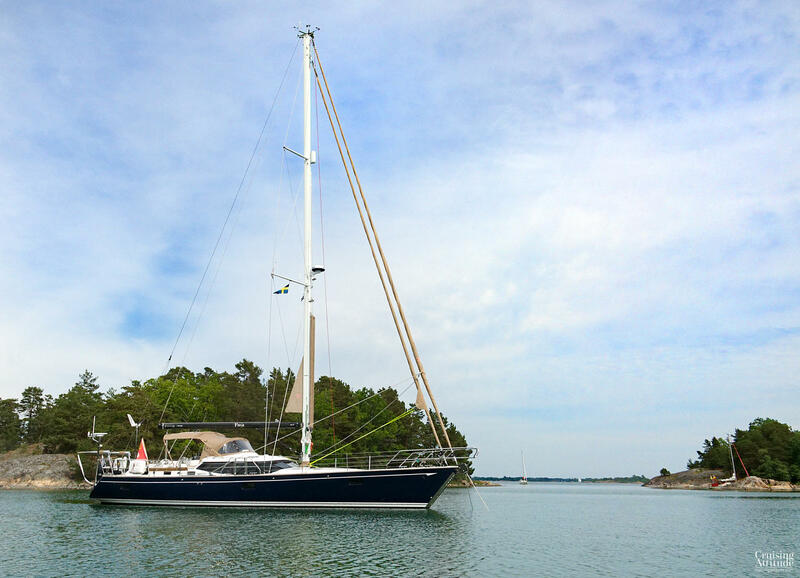 This anchorage provides good shelter from all winds from the southeast, south and west. We had southeasterlies while we were there.